This post is a bit of a cheat because I didn’t do any of the tough work on this dish… I just helped. Also, this isn’t a recipe post. It’s more of a “results of our experiment” post. Hahahaha. For this experiment, we decided to stick to one of our usual combinations of sauce and toppings, just to keep it simple. J made his usual dough. For the sauce, I took full advantage of the wealth of fresh basil we have right now and made a lightly tomatoey basil sauce with lots of olive oil. 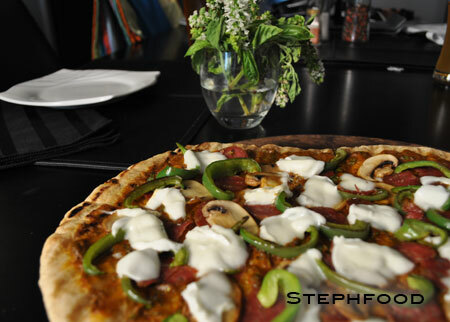 For toppings, we used mushrooms, green peppers, thinly sliced smoked sausage and buffalo mozzarella. The second tip was the one that made lightbulbs go off for me. I had never heard it before, but it made total sense. On the BBQ (especially a little propane one, like ours), the bottom will cook before the top. Unless you want your crust to burn, you need to cook your veggies and other toppings that need to be cooked. I sautéed the mushrooms and green peppers to release the liquids, and J lightly pan fried the sausage slices to release some of the fat. 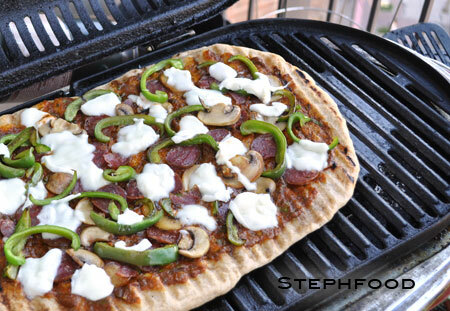 The dough goes on the BBQ first, to grill the bottom before any toppings or sauce go on. 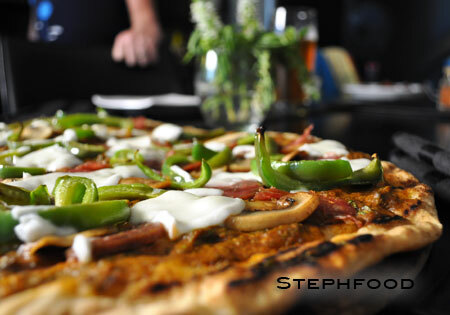 Once the bottom is cooked nicely, flip the dough and add the toppings to the cooked side. You want to cook it long enough to get a nice crust with grill marks, and to melt the cheese. Since the veggies were already cooked, we don’t have to worry about them! Seriously, J was over the moon. It was so delicious, and he was so proud of himself for finding a way to make pizza in the summer. We kicked ourselves for waiting this long to try it. Do it. You will not regret it! The one thing that I want to improve for next time is a way to keep the pizza warm after it’s done cooking. We took it right off the grill, and it did cool off while we were eating. It wasn’t terrible, but I think we can do better. Maybe if we took it off the grill long enough to cut a couple of pieces and let the grill cool a little, we could return it to the grill to keep warm. Hm.